Sick of the piles of disposable utensils and napkins that come with your takeout orders? Well thankfully, someone is speaking up against all that waste. 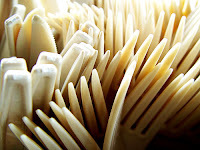 A new movement started in NYC by ecoagents* is spreading the word to restaurants, that, well, some people don't need or want those plastic forks wrapped in cellophane. It's called eco to go and I hope it catches on. When you call to place your order, just say "eco to go" and they'll omit all the extra stuff you don't need. Find participating restaurants here: eco to go via ideal bite. *Ecoagents is a non-profit working to protect the Amazon Rainforest and empower the indigenous communities to sustain their way of life and their native environment. These days, everyone's going green. Even political pundits. Check out the Huffington Post's new blog here.